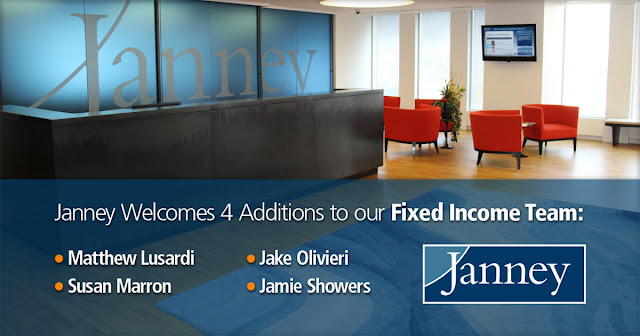 PHILADELPHIA, PA – July 18, 2016 – Janney Montgomery Scott LLC (“Janney”), a leading full- service wealth management, financial services and investment banking firm headquartered in Philadelphia, PA, today announced the hiring of four new fixed income professionals. Matthew Lusardi, Susan Marron, Jake Olivieri, and Jamie Showers have all joined the firm. Matthew Lusardi, Fixed Income Sales - Matt joins Janney as a Director in the Securitized sales group and will be located in Janney’s Chicago office. He brings eighteen years of diversified fixed income sales and advisory experience to the firm. Matt has held positions at KGS Alpha, JPM, Merrill, Lehman and Ernst &Young. Matt earned his degree from Indiana University – Kelley School of Business. Susan Marron, Fixed Income Sales - Susan joins Janney as a Managing Director in the Municipal sales group and will be located in Janney’s New York office. She brings a wide range of experience in the Municipal marketplace to the firm. Susan has held positions as a Trader at Citi Asset, Portfolio Mgr at Deutsche Bank and Sales at Barclays Capital, Sterne Agee and Cantor Fitzgerald. She earned her degree from Hofstra University. Jake Olivieri, Fixed Income Sales - Jake joins Janney as a Fixed Income Sales Associate on the CD Sales desk in New York. He comes to Janney from Bank Hapoalim, where he worked on the Private Bank Trading desk. Jake earned his degree from the University of Scranton’s Kania School of Management. Jamie Showers, Fixed Income Sales - Jamie joins Janney from Stifel Financial as a Director in the Securitized sales group, he will be located in Janney’s New York office. He brings 24 years of diversified fixed income sales and trading experience to the firm. Jamie has held positions at Knight Capital, HSBC Bank, Deutsche Bank and Bear Sterns. He earned his degree from St. Lawrence University in New York.